All that to say: less time to read also means less time to write. But I want to start writing reviews again, and since Joshua has kindly (if imprudently) lent me a soapbox, I get to inflict those reviews on you. Besides: it's 2016, the Current Year. That seems to be an acceptable reason to do anything these days, so I may as well appropriate it myself. I'll be reviewing all sorts: fiction, non-fiction, fiction that self-identifies as non-fiction, and vice versa. I'm going to have fun with it. My head is generally clearer after writing; whether yours is clearer after reading what I've written is another matter entirely. Let's burn that bridge when we come to it. 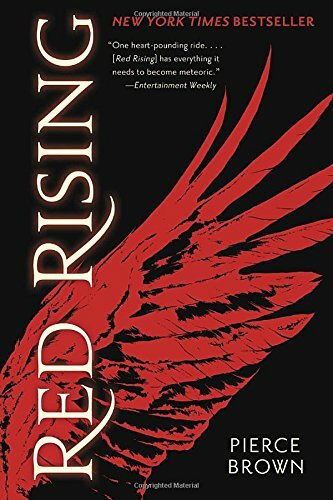 Red Rising is the first in a trilogy and has been likened to The Hunger Games, which (in this reviewer's opinion, at least) is at once unfortunate and misleading. While both stories revolve around heroes and heroines bucking the status quo in futuristic, quasi-dystopian societies, that's pretty much where the similarity ends. I say that as a modest fan of Collins' work. She's a good storyteller. But Pierce Brown is in another league entirely. I didn't give you a synopsis for two reasons: firstly, because the less you know going in, the better; secondly, because of what I said firstly. Suffice it to say there's some terrific world-building, a memorable cast of characters, and enough dramatic vim to keep even the most reticent reader turning pages late into the night. Hard-hitting action notwithstanding, Red Rising is ultimately a consideration of honor, morality, hierarchy, equality, and violence, and the roles they play (for good and for ill) in civilization: the making of it, the sustaining of it, and the destruction of it. Final verdict? In the words of Lt. Archie Hicox, “Damn good stuff.